I've wondered at times whether the ancient Greeks might have had an easier time explaining their gods to their children. Despite the sheer number of them, their gods were human-like in their baseness: illustrating greed, hatred, vanity, and all the other traits of degenerate man. Man could identify with such gods, because they saw traces of them every day. One of the hardest things to teach children (or adults for that matter) can be that God is good. I don't mean that we don't put forth a valiant effort. The early choruses we teach our children--"God is love, " "God is so good," etc, all clearly state the nature of God. But something clearly stated is not always something clearly communicated. One of the ways we try to explain God to children is as a loving father. Jesus did the same when he used the term "Abba" --equivalent to our "Daddy." We tell children that God is a loving Father, who longs to take us into His arms. But what does this mean to someone who was raised fatherless? Or with an abusive parent? I can personally testify that the idea of God as a benevolent father is a challenging concept for a child who has spent hours cowering in a closet while a drunken parent rampages through the house. Then we tell them that God is not only a loving Father, but the creator of everything good. We tell them of Adam and Eve and a garden. We sing them cute little songs of how God made everything. We paint this cozy little picture of dolphins and puppies and butterflies. But what happens when the floods rise, the hurricanes blow, the earth shakes, and wildfires destroy the landscape? Is God still good? It doesn't take long to see that God is often defined in our minds by our circumstances. What we hear flies swiftly to oblivion, and we tend to operate on what we see or feel of the world around us. And what we see is often wickedness, vanity, suffering, and pain. It's hard to understand a good and loving God in that context. If God is really there, then why does He allow evil to go on? If God really loves me, why can't I see Him or feel His presence? If God really cares about me, why am I in this circumstance? Will somebody please explain this to me? And so God did. One only needs to open the Bible to the beginning to hear these same themes echoed. In Genesis chapter one, God speaks a beautiful world into existence, and calls it good. In Genesis chapter two, God places man in a lush garden, filled with all good things. He then fellowships with Adam and Eve face to face. In chapter three, a serpent comes asking a question. "Hath God said...?" He then goes on to question God's motives. He tells her that God's been withholding something good from her. See for yourself. And Eve looked, and the fruit did seem like it would be a good thing. So Adam and Eve trusted their own eyes and their own wisdom, instead of what God had said. And all the seeming injustices of the world are explained in this one verse. We don't see the world correctly when we cast ourselves as the hero of our story (or the victim either, for that matter) and God as a villain. God IS good. It's we who are not. If I can continue the casting analogy, I'd have to say that God is the hero, and we are a second villain, only after the serpent. Fortunately, for some reason known only to God, we are also the love interest. And then the ultimate love was offered. God condescended to walk among sinful man again. Jesus explained the love of the father and how our sins had separated us from him. He taught through parables how the prodigal son could come home to the loving arms of the Father. The message was that a loving God wanted sinful man to come to him. And Jesus' blood paved the way for that to happen, as he took the penalty for man's sin through his death on the cross. But even after coming to Him, and receiving His grace, it's so easy to listen to the voice whispering in our ear. When we go through a trial, it whispers, Does God really love you? When making a decision, it whispers, Is God's way really best? When we feel alone, Does He really care? And the tempter designs that we trust our own way instead. Which voices are we listening to? Question: Can you think of a time in your life when you doubted God's goodness, but now you see his plan? Or maybe you'd care to share how God was good to you this week. Barbara Early grew up buried in the snowy suburbs of Buffalo, NY, where she developed a love for all things sedentary: reading, writing, classic movies, and facebook scrabble. She holds a degree in Electrical Engineering, but her penchant for the creative caused her to run away screaming from the pocket-protector set. 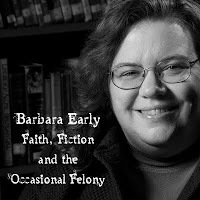 Barbara cooks up cozy mysteries with a healthy dose of comedy and sometimes a splash of romance. Her holiday novella, Gold, Frankincense and Murder will be released from White Rose Publishing in time for the holiday season. You can learn more about her writing on her personal blog: http://barbearly.blogspot.com/ or see what's for dinner on her recipe blog: http://bflogal.blogspot.com/. What a powerful post, Barb. Too often we tend to judge God's goodness based on our circumstances, as you said, which is utterly wrong. God has been good to me in lots of ways this week, but...I've got some things in my life which wear on me, and God hasn't removed them or necessarily even given me a great insight in how to handle them. But He's teaching me to lean more on Him for patience, compassion, and endurance. And He reminds me He's there, which is very good indeed. Happy Sunday, Barb. It's ironic that you mention the ancient Greeks and their gods because I'm reading Francine Rivers' Mark of the Lion series. And what is striking me most is that even with my university level courses in the Humanities where I studied ancient civilization, mythology, early Christianity, etc, I never once understood the horrors of that society until now. Carla Capshaw, Roseanna White and others touched upon this, too. I live by faith, yet the more I learn of what the early Christians went through, I wonder if my faith would have survived the test. Take Marcus, in An Echo of Darknes. He isn't a believer and has been raised on whatever gods seem to suit his curent situation. His over-riding question is - How could a father do this to his children? How could a loving god allow the monstrosities the Romans incurred against the Christians? But then we see it through Hadassah's eyes. She knows God as a loving Father who's given His children free will. He won't interfere with that even when they're bent on destroying themselves. He's even given them His own Son to take on their sin. But they rejected Him. What's a Father to do? What can any father do? Simply put, He loves us, puts things and ideas in our path to get our attention, and waits for us to smarten up. Bless you for writing this post, Barb. I can empathize. It's been a tough week for me, which is probably what triggered this post. But I just came back from a wonderfully encouraging message from Psalm 31 on the life of David, and how to handle stress. I've found it also helps with frustration and discouragement, which is more of what I'm dealing with now. But the remedy was Trust Him. Part of me wishes that one of God's promises to us was a trouble free life. Not so, but He did promise to be with us through it all. You've had a very good week. And I'll have to check out that book. When I think of the early martyrs, I am amazed of how much they endured and still remained faithful. But think of how that faith exhibited turned the world upside down! I know in myself, I could not stand such a test. But then again, I'd imagine they would have said the same thing. It's encouraging to know they were servants of, and empowered by, the same almighty God we serve! Thinking about Anita's comment. I love how great fiction gets us really thinking. Anita, you'll need to check out Sandi Rog's Yashua's Bridge when it's out in a few months. Barb, that's such an empowering thought - that we serve the same God of those early Christians. And to think 2,000 years is nothing in God's calendar of time. I think it's early 2012. I read it for endorsement. It's not even on Amazon yet. I don't know that I've ever had the thought that God wasn't good or that He wasn't there. Not that I'm trying to say I'm perfect in any way, shape or form. Because, though I don't recall having those thoughts, I do know there are times when I tend to NOT go to Him first. That's the challenge I need to work on. Before I have a moment of panic or worry or despair, I need to acknowledge Him. Great post, Barb. Lot's to think about. I do sympathize with the little children hiding in closets from drunken fathers. It was a real challenge teaching my little niece about God, the loving father, when her biological father had caused such upheaval in the first few years of her life. God has blessed me this week with an unexpected trip to the coast. It's drizzly and rainy, but my favorite times to go to the beach are on stormy days because I can see God's power so visibly. When things are bad, I find myself questioning, not whether God is good or not, but whether he loves me. And if He is good and if He loves me, then it must be that I am not good enough. It's lucky I wasn't born in an earlier century. I would have spent my life in penance. But he is good. And he does love me even when I can't "feel" his love. I've been trying to imprint it on my brain as a fact. Because God's love is not fleeting emotion like ours is. It is fact. I marvel at the wonder of storms too. There's something about a storm that illustrates God's power and our weakness--in a way that makes me realized how much I can (and need to)trust him. Yep, I know those feelings too. Very similar effect. If the tempter can cause us to doubt God's care for us, it's effectually just like doubting his goodness--or his existence for that matter. I know what it is like to feel like I'm not good enough for God's love. But I guess that is doubting the character of his love and grace. But isn't it wonderful to know we have a God who loves us unconditionally and perfectly? And yes,it's true, we're not good enough to deserve it. He doesn't love us because of who we are, but because of who He is! Amazing! Uggh. Blogger eats my comments. Amazing post, Barb!!! Just amazing! That blogger has been hungry lately. I've had a few eaten too.